Grape seeds are a by-product of the pressing of grapevine (Vitis vinifera L.) berries for making wine or grape juice. Grape seed oil meal is the by-product of oil extraction from grape seeds. Grape seeds and grape seed oil meal are fibrous, tannin-rich by-products of limited nutritional value, even for ruminant livestock. Since the year 2000, these products have received renewed interest due to their potential as sources of polyunsaturated fatty acids and beneficial antioxidants. Note: this datasheet only contains information about grape seeds and grape seed oil meal. It does not provide information about feed additives based on grape seed extracts. Grape berries usually contain two seeds which represent up to 6% of berry weight, though the number and weight of seeds vary according to its total weight and maturity. The wine-making or juice extraction processes yield grape pomace, which contains about 17% of grape seeds on fresh weight basis (38-52% of dry matter). Grape seeds are valuable: they contain 8-20% of a high-quality dietary oil rich in polyunsaturated fatty acids and vitamin E, and 5-8% polyphenols with potential antioxidant properties (Ye ZhiJing et al., 2016). Grape seeds are often separated from the pomace by loosening the pulp from the seeds in a breaker, after which a vibrating sieve separates the seed from the skin (Göhl, 1982). The seeds can then be used directly or processed for the production of oil or extracts rich in tannins. Grape seed oil production is carried out by mechanical pressure (screw press) followed or not by solvent extraction, which yields grape seed oil meal (Rombaut et al., 2014). 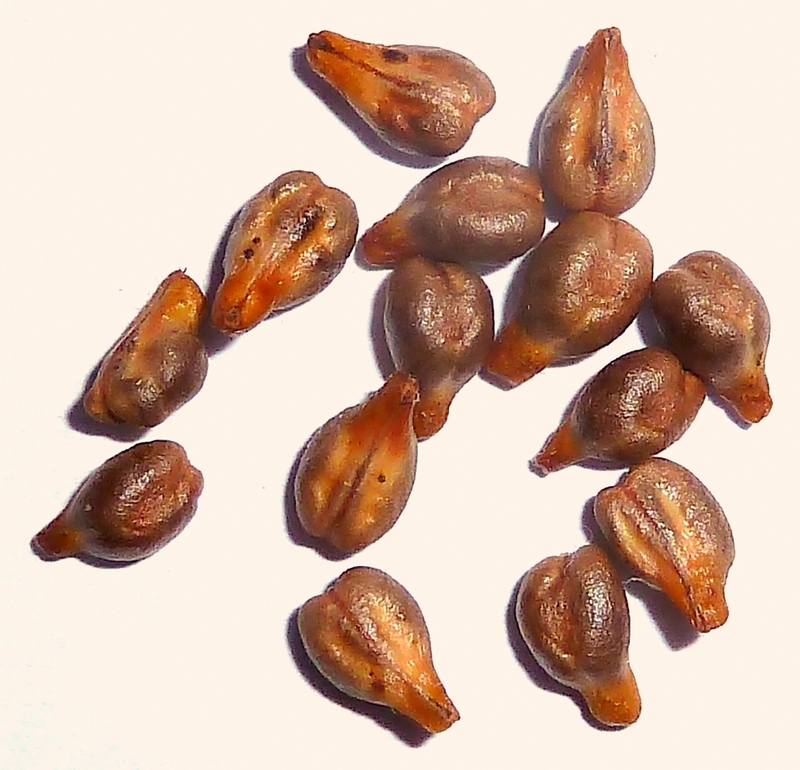 Grape seeds separated from the grape pomace are mostly used to produce a high-value edible oil. They have also become a source of polyphenols, marketed under names such as "grape seed extracts". Grape seeds and grape seed oil meal are occasionally used to feed livestock. The grapevine is native to an area going from North-East Afghanistan to the Southern borders of the Black sea and Caspian Sea. It was domesticated there around 4000 BCE and later spread to the Mediterranean Basin, Western Europe, India, China and Japan. The grapevine was introduced into the Americas by the Spaniards. It is now cultivated worldwide. In some cases, it hybridized with native Vitis species, resulting in cultivars adapted to local conditions. The grapevine is grown in both hemispheres, predominantly within 20 and 50°N, and 20 and 40°S. It can grow in tropical areas at altitudes between 300 and 2000 m. However, growth and fruit production are poorer above 1200 m. The grapevine requires a long, sunny, and warm season for the grapes to ripen, and a relatively severe winter that promotes plant dormancy. It withstands winter frost down to -20°C, but light frost of -3 to -5°C kills regrowth during spring, thus reducing yield of fruit. Summer temperatures of 25-30°C are optimal for shoot and berry growth. A hot and dry summer is best suited for fruit production as it reduces disease. The grapevine grows in most soils, light or heavy, deep or shallow, fertile or not, but responds to better soils with higher yields. Soil pH should be between 5 and 8 and values slightly below 7 are considered best. Light soils promote early ripening and a high sugar content. Soil texture is more important than soil fertility. Deep and well-drained soils are preferred as they favour extensive root development. The grapevine is tolerant of drought stress, and still survives and grows in semi-arid conditions where other crops fail. It is a full sunlight species, but the leaves must protect the fruits from sun scorch. The grapevine should be sheltered or planted where strong winds do not occur (Ecocrop, 2016; Ketsa et al., 1991). Grapes are one of the world's most important fruit crops in terms of area grown, production and monetary value. In 2012, grapes were cultivated on more than 7 million ha, producing 69 million t of fruits with an average yield of 9.6 t/ha. 40 million t of grapes were used for wine (about 90%) and juice (about 10%, fresh or concentrated) production, 24 million for fresh fruit and 5 million for dried grapes (raisins) (OIV, 2016; Castellucci et al., 2013). The most important producers were China (9.6 million t), the USA (6.6 million t), Italy (5.8 million t), France (5.3 million t), Spain (5.2 million t), Turkey (4.2 million t), Chile (3.2 million t), Argentina (2.8 million t) and Iran (2.1 million t). The EU accounts for 75% of grape production and 57% of wine production. The main wine producers are Italy, France, Spain (where most of the grape production is used for wine) and the USA. China is mostly a producer of fresh fruits (FAO, 2016). It is difficult to estimate the amount of grape seeds released as a by-product, since the proportion of seeds separated from the pomace is unknown. Assuming a worldwide production of 40 million t of fresh grapes used for wine, with a seed proportion of 1-6%, the potential amount of grape seeds can be estimated between 0.4 and 2.4 million t.
Grape seed oil is extracted by continuous mechanical pressure (screw pressing) and/or by a solvent process. Mechanical pressing achieves lower yields than solvent extraction, but ensures a higher oil quality. It is used generally for economic reasons (small production or boutique products) (Rombaut et al., 2014; Bekhit et al., 2016). As for other oil meals, grape seed oil meal obtained by mechanical extraction can retain significant amounts of oil, while solvent-extracted grape seed oil meal should contain very little oil. Grape seeds have a low protein content (9-11% of DM) and very large amounts of fibre (NDF more than 65%, ADF more than 50% DM, crude fibre more than 33% of DM) and especially lignin (37-55% of DM). Their oil content is between 8-20% of DM (Rombaut et al., 2014). It varies greatly among cultivars and is also affected by the stage of berry development. It increases up to the onset of ripening and then remains constant until harvest. Grape seed oil contains predominantly polyunsaturated fatty acids (64-75%). Linoleic acid (18:2) is the most abundant fatty acid, followed by oleic acid (18:1), stearic acid (18:0), and palmitic acid (C16:0) (Ye ZhiJing et al., 2016). Grape seed oil meal has a composition similar to that of grape seeds except that its oil content is lower. However, since the seeds can have an oil content as low as 8%, and yield of oil extraction can be as low as 55% (Rombaut et al., 2014), it may be difficult to distinguish mechanically-extracted oil meals from whole seeds on the basis of the composition only. The oil content should be lower than 1-2% for solvent-extracted meal. Grape seeds contain important amounts of phenolic compounds (5-8% polyphenols), notably flavonoids (Chedea et al., 2016; Ye ZhiJing et al., 2016). The most abundant flavonoids in grape seeds are gallic acid, catechin, epigallocatechin gallate, epigallocatechin, epicatechin gallate, epicatechin, and proanthocyanidins (polymers of flavonoids, also called condensed tannins) (Gessner et al., 2015). These compounds form complexes with proteins in the feed and with digestive enzymes leading to disruption of the digestion process and to loss of nutrients. They also interfere with mineral absorption, causing damage to the mucosal lining of the gastrointestinal tract (Bekhit et al., 2016). The high tannin content of grape seeds and grape seed oil meal is, along with fibre, one of the main contributors to their low digestibility and to their generally low nutritive value. The catechins of grape seeds are largely responsible for their bitterness (Letaief, 2016). Flavonoids are recognized as antioxidants with positive effects on the prevention of oxidative damage in tissues by the reduction of lipid oxidation and/or by blocking the production of free radicals (Letaief, 2016). For that reason, grape seeds and grape seed oil meal are being investigated for their potential beneficial effects, both on animal health and on the quality of animal products. Grape seed extracts are produced and marketed for a broad spectrum of pharmacological activities. Grape seeds and grape seed oil meal are low in protein, rich in fibre and tannins and, therefore, poorly digested by ruminants. Grape seeds have a higher energy value than grape seed oil meal, due to their higher lipid content, and can be used at up to 20% in ruminant diets (Magnier, 1991). It has been suggested that grape seed oil meal should not be fed to ruminants due to its low nutritive value, and instead it should be used as a carrier for molasses (El Boushy et al., 2000; Ferrando et al., 1966). However, studies have shown that grape seed oil meal can be included safely at up to 10% in ruminant diets, and higher inclusion rates have been reported (Magnier, 1991). There is little information on the palatability of grape seeds and grape seed oil meal. It can be expected that the high tannin content is detrimental to palatability. A trial in Spain found that calf and dairy cow diets containing 30-50% solvent-extracted grape seed oil meal needed an introductory phase to overcome palatability problems (Bayon, 1971). A comparison of the fractions of grape pomace found that the seed fraction had the lowest in vitro OM digestibility: 13-16% vs. 21-23% for the pulp fraction (Eraso Luca de Tena et al., 1992). In vivo OM digestibility values for grape seed oil meal were 24-28% (Cottyn et al., 1981). A value of 40% has been reported for the whole seeds (Magnier, 1991). Nitrogen degradability for both grape seeds and grape seed oil meal is in the 50-55% range (De Boever et al., 1984). Grape seed oil meal has been investigated for its potential reducing effect on methane emissions. Using rumen simulation technique, corn distillers grain (DDGS) mixed with grape seed oil meal (up to 20% in the mixture, corresponding to 5% grape seed oil meal in the diet) was found to modulate favourably rumen fermentation by lowering methane production without adverse effects on fibre degradation. It may also be beneficial to rumen health and animal production by forming complexes with some rapidly degradable carbohydrates, and thus may help to stabilize rumen pH in grain-rich diets (Khiaosa-ard et al., 2015). In Spain, a trial found that calves given diets containing 30% solvent-extracted grape seed oil meal had the same growth rate as calves fed a cereal-based diet. Up to 50% grape seed oil meal in the diet was possible without detrimental effects on health and carcass characteristics (Bayon, 1971). In Belgium, a series of trials concluded that 10% grape seed oil meal could be successfully incorporated in complete dry rations for fattening bulls, resulting in good performance and carcass characteristics. The feed value of grape seed oil meal could be compared to that of linseed chaff. Treatment with NaOH did not improve its nutritional value (Cottyn et al., 1978; Cottyn et al., 1981). Early trials found that whole grape seeds could be included in diets for lambs at up to 20% (Hogan et al., 1982) or 30% (Accardi et al., 1977). More recently, whole grape seed meal included in lamb diets at 10% of the diet produced weight gains and final live weights greater than those produced with the control feed. A 20% inclusion in the diet gave feed conversion indexes similar to those obtained using the control feed. Slaughter data, pH measurements, dissection data and chemical composition of the meat were not influenced by the type of feed. Increasing levels of grape seed meal decreased saturated fatty acids, increased unsaturated fatty acids and improved dietary characteristics of the meat, with the best indices of atherogenicity and thrombogenicity (Ragni et al., 2014). In Italy, a series of experiments with dairy ewes investigated the effects of dietary inclusion of grape seeds (300 g/d), alone or in combination with linseed (220 g/d), on milk production and milk quality. These dietary treatments had no adverse effects on milk production and health status (Nudda et al., 2015). They decreased the milk concentration of de novo synthesized fatty acids C10:0, C12:0, and C14:0, showing that grape seeds could be useful to increase the concentration of polyunsaturated fatty acids with potential health benefits for the consumer, especially when they were included together with linseed (Correddu et al., 2016). The addition of grape seeds (when combined with linseed) reduced the extent of light-induced oxidation of the total unsaturated fatty acids in milk (Correddu et al., 2015b). However, grape seeds were not effective in decreasing the biohydrogenation of dietary polyunsaturated fatty acids (Correddu et al., 2015a). In France, grape seed oil meal given as the sole feed to sheep caused weight loss and it was concluded that it was not suitable for sheep feeding (Ferrando et al., 1966). In Cyprus, in lambs fed diets containing 40% grape seed oil meal there was no detrimental effect on weight gain. However, feed intake was higher than for lambs fed the control barley-based diet, and feed conversion efficiency was lower. The increased intake was reflected in increased gut-fill and a correspondingly lower carcass yield (Mavrogenis et al., 1973). Grape seeds and grape seed oil meal are not valuable feed ingredients for pigs due to their low protein content, very high fibre content and high tannin content. They can only be used at a low level in the diet to provide antioxidants and polyunsaturated fatty acids. In Romania, the inclusion of 5% grape seed oil cake in diets for growing pigs did not affect performance and resulted in slight increases in carcass quality indicators (Ciuca et al., 2013). A maximum dietary level of 3-4% has been recommended for whole grape seeds (Magnier, 1991). Domestic poultry have been observed to select preferentially for the grape seeds fraction when offered grape pomace (Cornevin, 1892). In Spain, chickens of the local Penedes breed fed with a diet containing 5% grape seeds replacing maize in a standard diet showed no differences in performance. The meat showed a higher percentage of unsaturated fatty acids due to linoleic acid, a more nutty smell, a more metallic flavour and more stringiness (Francesch et al., 2015). In Korea, the supplementation of broiler diets with 1% ground grape seeds had no negative effect on growth performance. Some antioxidant indicators, including blood total antioxidant status and intestinal superoxide dismutase, were markedly elevated in response to dietary grape seeds (Jang et al., 2007). Grape seed oil meal is generally considered of too low a nutritive value to be used for poultry feed (El Boushy et al., 2000). However, a Chinese study concluded that grape seed meal could be included in diets for geese up to 9% of the diet (Wang BaoWei et al., 2010). Grape seeds were used at up to 15% in rabbit diets with good results (Alicata et al., 1988). In Spain, a series of studies found that defatted grape seed meal had a valuable energy content (DE 5.5 MJ/kg DM) for rabbits, compared to other lignified fibre sources. Its inclusion at moderate levels (15%) in the diet exerted a positive effect on feed intake, energy intake and average daily gain, with no impairment of cecal fermentation and mortality. The high proportion of cutin in the lignin of defatted grape seed meal possibly minimized the negative impact of lignin on cecal fermentation traits (García et al., 1999a; García et al., 1999b; García et al., 2002). It should be noted that an earlier study in Belgium found a much lower DE value (3.1 MJ/kg DM) (Maertens et al., 1985). In Italy, a dehulled and defatted grape seed meal containing less than 25% crude fibre and more than 20% protein was included at up to 20% of the diet of fattening rabbits, partially replacing dehydrated alfalfa and soybean meal, without negatively affecting health and carcass quality. However, a maximum 10% inclusion rate was recommended to maintain performance (Cavani et al., 1988). Grape seed oil meal was found to have a very mediocre value for horses (DM and OM digestibility of 11-12%), due to its high lignin content. Its use for horses is not recommended, or should be very limited (Wolter et al., 1980).